In an era of intense social and environmental challenges, Paulina Krzywosinska wanted to create a brand that promoted positive cultural change. 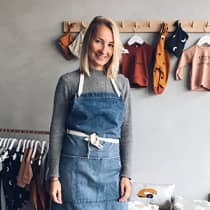 She opened Organic Zoo, an ethical childrenswear boutique in Brighton, as an antidote to the fast-fashion she saw dominating the market. The boutique exclusively stocks ethically produced, high quality products, with a range that adults and kids alike are guaranteed to love. "I have always passionately believed that the clothes we and our children wear should be long lasting, free from toxic chemicals, and carry a story we can be all be proud of. This is how Organic Zoo was born. "